NETWORK FINALS: CAUGHT ON CAMERA and both reruns of MASTERS OF ILLUSION lost 0.1 in final numbers. CABLE HIGHLIGHTS: ESPN’S final NBA PLAYOFFS game of the season, in which Cleveland took care of Toronto, topped Friday at 2.15. Discovery’s ALASKAN BUSH PEOPLE gained 0.11 to 0.68. History’s ANCIENT ALIENS ticked up to 0.32. The night was so low-rated that HBO’s REAL TIME WITH BILL MAHER made it into the Top 10 with a 0.28 rating, with lead-out VICE at 0.16. OWN’s FOR BETTER OR WORSE rose 0.02 to 0.26. 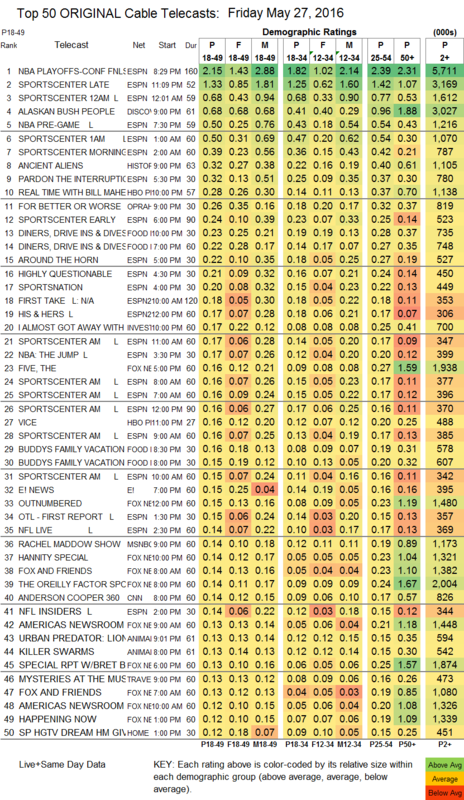 Food Network’s DINERS, DRIVE-INS & DIVES was at 0.23/0.22, following lead-in BUDDY’S FAMILY VACATION at 0.16/0.15. 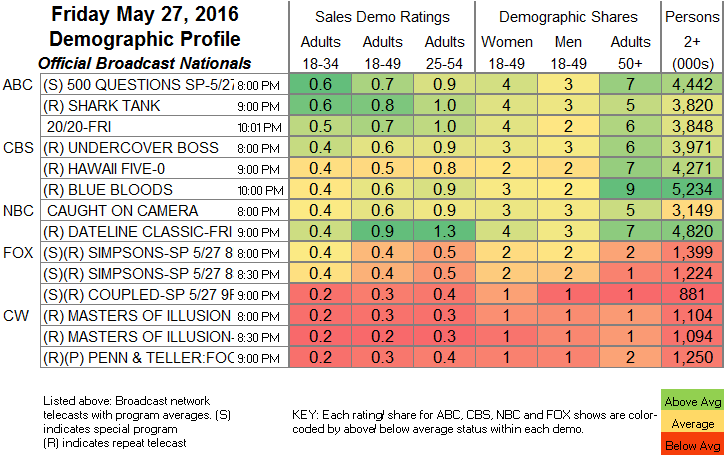 Even on such a quiet night, Syfy’s WYNONNA EARP couldn’t make it past the extended list, down 0.04 from last week to 0.08.